We started Day One with some serious ambitions. As always, this is our biggest day, with a 112-mile ride and a 6+ mile run on the agenda as the first Race Rehearsal workout. It’s a bit early for most, but a great litmus test as to how the remainder of your training will go…and the Team was all in. 18 campers rolled out at 8am. We committed to riding through mile 30 together, and for the most part that worked just fine. We enjoyed some cool weather, but our enthusiasm was dampened by the heavy traffic and growing sprawl/spread of people. Many places on the outskirts of The Woodlands look complete different in just the past two years. 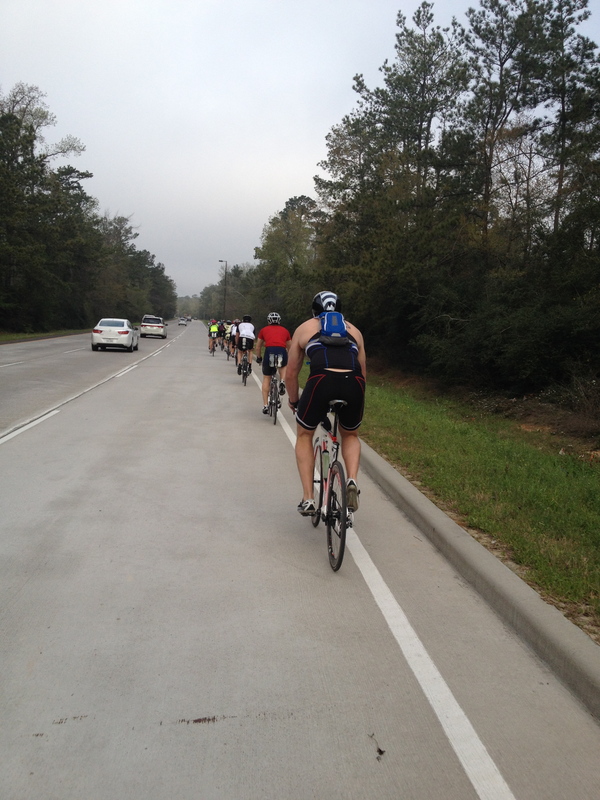 After our first SAG at mile 30, it was time for folks to get to work. The faster folks took off while the rest of us buckled down to get in some solid solo time. The calm was broken by a crash in the lead group, with one camper breaking his left pinky like a horror show….he’s en route home and healthy, and we send him our best!! It was back to business with almost 75 miles left to ride. By now the cool weather was gone and the wind was in full effect. The gas station in Richards is no more, and combined with the strong winds, it was enough to put a tri coach over the edge. Why Is Everyone Running Into the Woods? It was on to the insanely bad chip seal roads, but thankfully most of the damage was limited to a distinct 8-mile section. 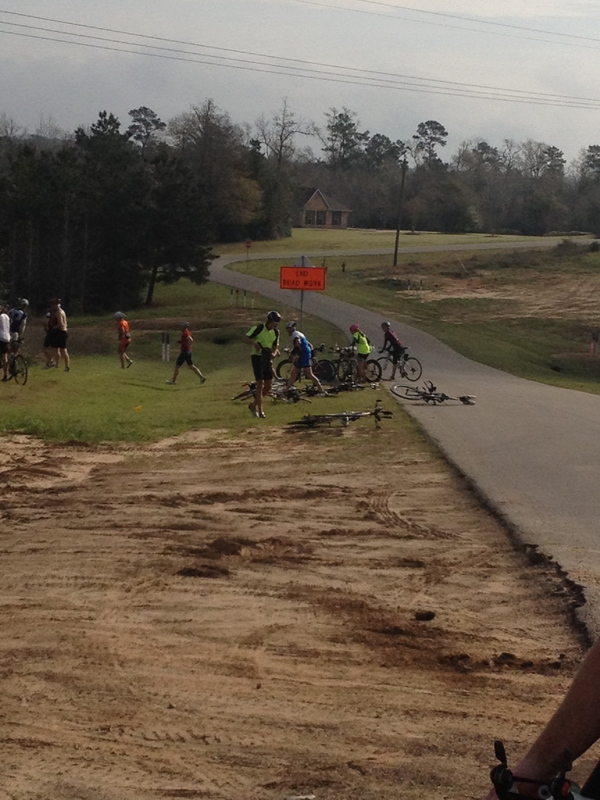 The winds weren’t backing down though, still blowing on Jackson Rd — after mile 80 — where it usually relents. Thankfully we had incredible support thanks to CyclesTX (www.cyclestx.com) — giving us food and drink just when we needed it most. The ride back down Woodlands Parkway had bumper to bumper outbound traffic (crazy!) and more stoplights than you could shake a stick at. One back to the hotel, many of the campers changed into run clothes and got it done (not me!). With just a few 60-minute trainer rides in the last few months, and my last long ride over a year ago, it was a challenge today but I got it done. Next up….another long ride day. After a long day on the bike, not everyone was excited to head out — again — for another long ride. 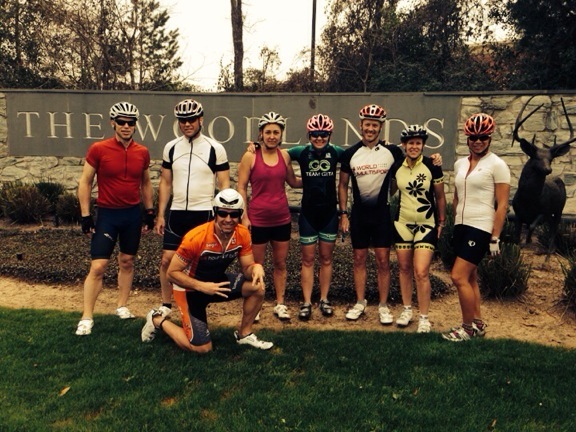 With a shorter option of 68 miles on the table, more than a few left the hotel with their options open. It’s funny how a little exercise removes the initial fatigue! After just 30 minutes the group was humming along with some folks even taking off at a faster clip. The weather cooperated, exchanging Friday’s wind with Saturday’s humidity…and some cloud cover. As a result, campers were treated to the “other” option to excessive wind — moisture and heat. While temperatures were tough, it was great to have the chance to feel what the course was like as a cyclist….vs just surviving it on a bike. There was plenty of speed to be found — outside of the dreaded chip seal, of course — and most folks were able to find that happy space. A few brave souls went the full 112, while others opted for the short route and a few ended up doing the “medium route” — aka Dora’s loop, since she suggested it. This was a great alternative, allowing folks to get in the mileage without overreaching. Returning at a normal time meant everyone got to eat and rest up before the evening presentation on Race Execution and our Team Dinner…both epic. Now it’s time to wrap our heads around Sunday’s long run!!! Day Three Recap — Long Run Time! After all that cycling it was time to get ride of the wheels and start running again. After all, the race is decided on the run, and the chance to explore the Texas course is a distinct advantage. We ran out from the hotel as a group and headed over to North Shore Park (we staged a car there as our water / refueling station). After a brief explanation of the race day layout of the park and swim course, we headed out for the first of two five mile loops. The weather was decidedly cool and very atypical as compared to what the actual race will be like in approximately two months. We made the most of it, getting in some really solid pace work since the head wasn’t going to crush us. There were quite a few other runners and pedestrians about, which helped with motivation and focus. When it was all said and done, campers ran between 10.5 and 16 miles…mostly with a negative split!!! You can find out more about the Endurance Nation Race Camp series here (https://www.endurancenation.us/camps/im-course-rallies/), where we have several other events coming up over the course of the season. Don’t miss out — lock in your training camp slot today! Great honest report. Enjoyed it a lot, even learned a few things, such as the “dreaded chip seal” I knew nothing about! Sorry I couldn’t be there with you folks. 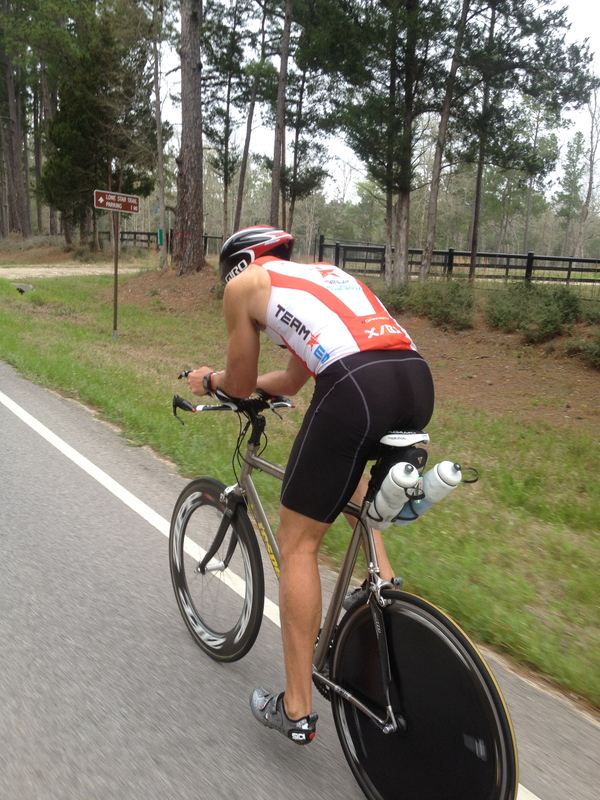 I will try to ride parts of the course when I get there in May. Good luck! Thanks!!! It’s much better than in past years…but there’s still a really, REALLY beefy section…stay tuned for info on our FREE Four Keys talk for the Thursday before the race…. 🙂 Will be great to meet you!